Victim of Utah Hospital Negligence? Hospital negligence can occur in a number of different ways. Modern medicine is truly a miracle. Thanks to modern technology and modern medicine people live longer healthier lives than ever before. Unfortunately, modern medicine cannot prevent human error, and the staff of hospitals, including the doctors and nurses who attend patients, are only human and do make mistakes. Every health care provider employed by Utah hospitals is required to meet the “standard of care” when treating patients. What that means is that within the health care community there are certain requirements that must be met when treating a patient depending on the patient’s symptoms. If the hospital staff does not meet the standard of care, the hospital is liable for the damages that the patient suffers as a result of the sub-standard treatment. There are many examples of Utah hospital negligence including surgical mistakes which can result from conducting surgery at the wrong site, using unsanitary surgical instruments, leaving surgical instruments in the body, and anesthesia errors. Other examples of hospital negligence include misdiagnosis or a failure to diagnose which often results from failing to order the proper testing. The results of misdiagnosis vary and can even include death, which could then lead to a wrongful death lawsuit. Similar to the failure to diagnose is the failure to consult with a specialist such as an oncologist if there is reason to suspect cancer; and, the failure to properly monitor the patient while in the hospital. Medical malpractice at hospitals also occurs when faulty medical devices are used, when improper prescriptions are prescribed, and when procedures are carried out on the patient without the patient’s consent. One of the most heart-breaking and detrimental forms of Utah hospital negligence involves birth injuries. Newborns are delicate and require the utmost care, but in the day to day business of hospital births this important truth is often neglected and babies are injured as the result of hospital negligence. Injured newborns will likely face life-long repercussions and will require medical support throughout their lives. If the hospital was negligent in causing the injury, the hospital is required to compensate the baby so that the baby will have sufficient resources to treat his injuries throughout his life. Let the medical malpractice attorneys and personal injury lawyers at Salcido Law Firm PLLC fight for you in your Utah hospital negligence case. We know how to get you all of the compensation you deserve to be able to take care of the injuries you suffered as the result of the hospital’s negligence. 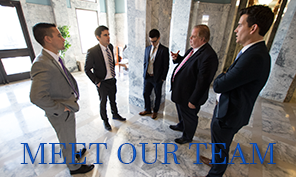 We are aggressive and intelligent advocates who will have your best interests in mind. Call us at 801.413.1753 or 888.337.3235 for a free consultation or email us and we’ll get back to you right away. Hire the pitbulls at Salcido Law Firm and Get Protected! today.